(Nanowerk News) Prototypes of nano-cellulose based filters with high purification capacity towards environmentally hazardous contaminants from industrial effluents eg. process industries, have been developed by researchers at Luleå University of Technology. The research, conducted in collaboration with Imperial College in the UK has reached a breakthrough with the prototypes and they will now be tested on a few industries in Europe. "The bio-based filter of nano-cellulose is to be used for the first time in real-life situations and tested within a process industry and in municipal wastewater treatment in Spain. Other industries have also shown interest in this technology and representatives of the mining industry have contacted me and I have even received requests from a large retail chain in the UK," says Aji Mathew Associate Professor, Division of Materials Science at Luleå University. Researchers have combined a cheap residue from the cellulose industry, with functional nano-cellulose to prepare adsorbent sheets with high filtration capacity. The sheets have since been constructed to different prototypes, called cartridges, to be tested. They have high capacity and can filter out heavy metal ions from industrial waters, dyes residues from the printing industry and nitrates from municipal water. Next year, larger sheets with a layer of nano-cellulose can be produced and formed into cartridges, with higher capacity. 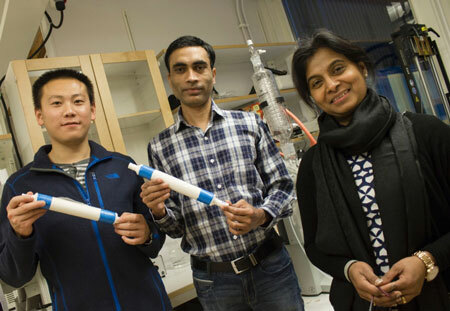 Aji Mathew assistant professor at Luleå University of Technology with her graduate students Peng Liu and Zoheb Karim with prototypes of nano-filters. "Each such membrane can be tailored to have different removal capability depending on the kind of pollutant, viz., copper, iron, silver, dyes, nitrates and the like," she says. Behind the research, which is funded mainly by the EU, is a consortium of research institutes, universities, small businesses and process industries. It is coordinated by Luleå University led by Aji Mathew. She thinks that the next step is to seek more money from the EU to scale up this technology to industrial level. "Alfa Laval is very interested in this and in the beginning of 2015, I go in with a second application to the EU framework program Horizon 2020 with goals for full-scale demonstrations of this technology," she says. Two of Aji Mathews graduate student Peng Liu and Zoheb Karim is also deeply involved in research on nano-filters. "I focus on how these membranes can filter out heavy metals by measuring different materials such as nanocrystals and nano-fibers to determine their capacity to absorb and my colleague focuses on how to produce membranes," says Peng Liu PhD student in the Department of Materials Science and Engineering at Luleå University of Technology.